this computer is the most powerful computer. Applications used are usually more inclined to scientific research. This computer usually has multiple processors at once to perform its task. Super computers typically excel at the speed of ordinary computers using innovative designs that allow them to perform multiple tasks in parallel, as well as complex civil details. This computer typically mespesialisasikan for certain calculations, usually the calculation of numbers, and in general tasks are not good results. Supercomputers are used for intensive-calculation tasks such as weather forecasts, climate research (including global warming research, molecular modeling, physical simulations such as airplane simulations in wind tunnels, nuclear fusion simulations, and nuclear fusion research). Military and science agencies one of the major users of supercomputer.b. Mainframeat the beginning of the era of computerization, the mainframe was the only computer available at the time. This mainframe can serve hundreds of users at the same time. This computer is similar to minicomputers but larger and more expensive. Its use is generally for data processing from a division or large companies that require considerable processing.c. Minicomputermainframe computers are very expensive and only large companies can use them. Tomake the computing more available made a type of computer that is smaller than the mainframe called minicomputer developed since the 60's. This type of computer is used more broadly than the mainframe, because the reason to get that is not more expensive than the mainframe but easier in operation and maintenance. Currently the term minicomputer is equated with the server, because its main role is to coordinate a computer network. Personal Computer (PC) is a computer device intended for one user. The device consists of CPU, keyboard, monitor, and mouse. These devices can be summarized in one table, not needing too much space. 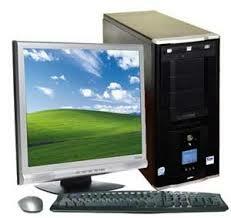 This type of computer is most widely used in various places such as home, school, office, and so forth.